Click here to listen to Interviews with significant members of the Violet Town Community. In 2009 Violet Town landed a huge coup when local resident and renowned artist Michael Leunig agreed to create entry signs for the town. The signs appear at four of the town’s entrances – each end of Cowslip St, Nalinga Road and the south end of High Street. Leunig said that “although it’s only a sign, this can make an expression about a town. That’s the advantage of a small town – it doesn’t have to be stodgy and boring but can have spirit and be a model for larger towns”. 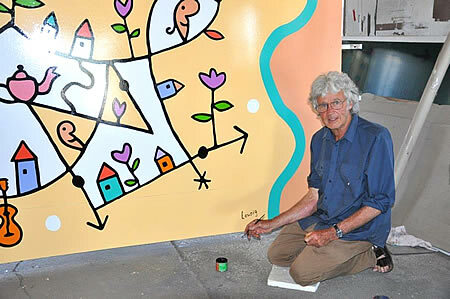 Michael Leunig is an extremely well known cartoonist, philosopher, poet and artist. He has explored political, cultural and emotional issues for over thirty-five years. He was made one of Australia’s Living Treasures by the National Trust of Australia in 1999. He was also a major contributor to the opening ceremony of the 2006 Commonwealth Games and there is even a Leunig-painted Melbourne Tram. THE sickening impact of the Southern Aurora ploughing into a goods train alerted the people of Violet Town to disaster before any CFA alarm could sound. 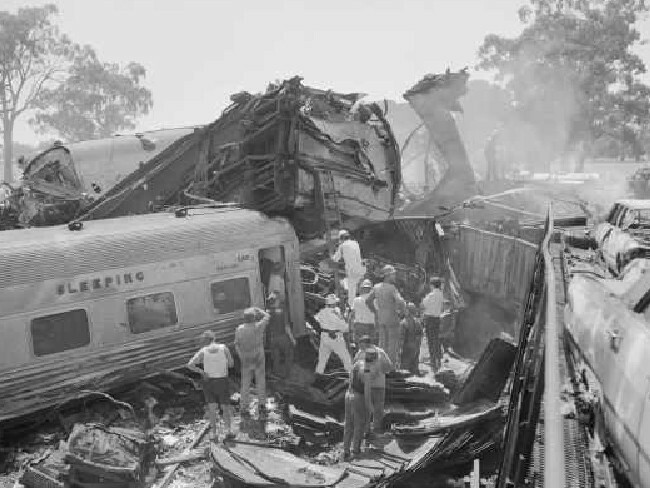 Like the passengers aboard the Southern Aurora, people in Violet Town were just beginning to greet the already hot morning on 7 February 1969, when the trains collided at a level crossing on the edge of town. “The tremendous crash rocked buildings in Violet Town,” a Herald report from that day said. The quick actions of emergency workers, many of them volunteers, and residents who flocked to help saved many lives amid the Southern Aurora’s twisted, smouldering carriages. 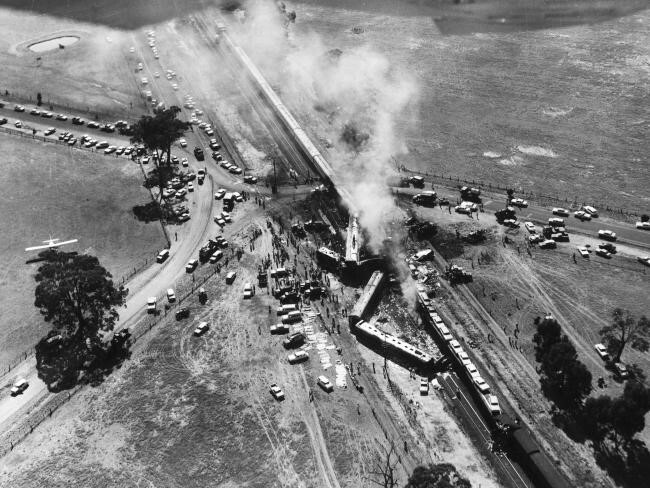 The driver of the passenger express had had a heart attack and died and the Southern Aurora, carrying its crew and about 190 passengers, shot through the Violet Town crossing loop, where it should have stopped to allow an Albury-bound goods service to pass. 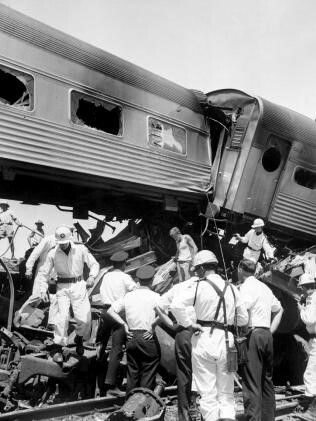 Nine people were killed, including the two drivers, a conductor, a railway electrician and five passengers, and 117 people were injured in the horrific tangle of wreckage. The Southern Aurora’s power van burst into flames on impact and set fire to several mangled carriages but, within minutes, rescuers doused the flames. The people of Violet Town, population 600, rallied along with emergency workers and passing motorists who stopped to help at the scene. Others fed and comforted shocked passengers at a local hall, or assisted at a makeshift emergency depot and triage centre at a pub. A plaque, erected in 1994, now marks the spot where the Southern Aurora tragedy occurred, at the McDiarmids Road level crossing on Violet Town’s western edge.